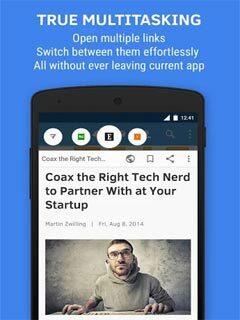 ***** Featured as one of the essential apps on playstore by Google. 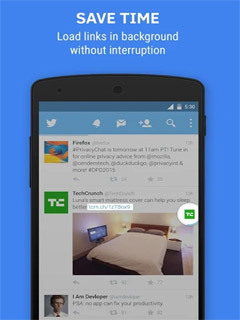 * SAVE TIME : It loads articles and other links in background while you continue using your current app. 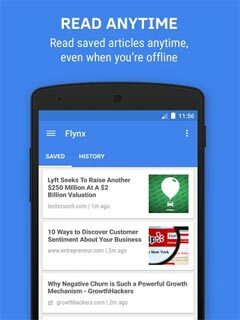 * SAVE DATA, LOAD FASTER : Flynx intelligently gets rid of all ads and unnecessary clutter from blogs and articles, saving you lot of mobile data. * READ EASY : Flynx displays news articles and blogs in a beautiful, easy-on-eyes view, allowing you to focus only on meaningful content. 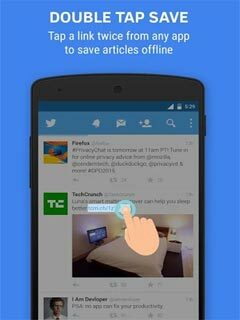 * SAVE OFFLINE, READ LATER : Saving articles offline is super easy. Just double-tap a link from any of your favorite apps and thats it! * TRUE MULTITASKING : Flynx makes multitasking effortless by allowing you to open multiple links and switch between them easily, all without ever leaving current app. 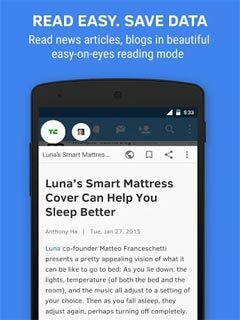 * SMART SHARING : Share links quickly to your favorite apps like Facebook, Twitter, Pushbullet or save links directly to Pocket, Instapaper, Readability, Evernote, etc. * FLYNX IN YOUR LANGUAGE : It has been translated into over 15 languages including Arabic, Brazilian, Chinese, French, German, Japanese and Spanish. Thanks to amazing volunteers from all over the world.